What a year 2017 is shaping up to be for the car industry. There are numerous new models scheduled to come on to the market in the coming months, ranging from standard family hatchbacks to brilliant sports cars, so expect an action-packed year ahead. However, with so many manufacturers planning something big for 2017, we thought we’d better pick out some of the very best new cars we’re looking forward to in the year ahead. There’s some easy-to-spot trends in the new car market, with more and more manufacturers capitalising on the SUV boom that’s hit the UK in recent years. Every company is now trying to get a share of this rapidly-growing sector but that doesn’t mean they’ve given up on the rest of the range though as you’ll also find a wide variety of superminis, family cars, sports cars and hatchbacks on this list. A few models will receive long-overdue upgrades too, particularly luxury and executive cars like the Mercedes C-Class, Audi A8 and Mercedes S-Class. We’ll also see some of the most important models upgraded – the best-selling cars on the market – like the Volkswagen Golf and Nissan Qashqai. Alfa Romeo is on a high at the moment, after the enthusiastic response to its Giulia saloon. Now the Italian brand is set to boost its order books even further with its first SUV: the Stelvio. 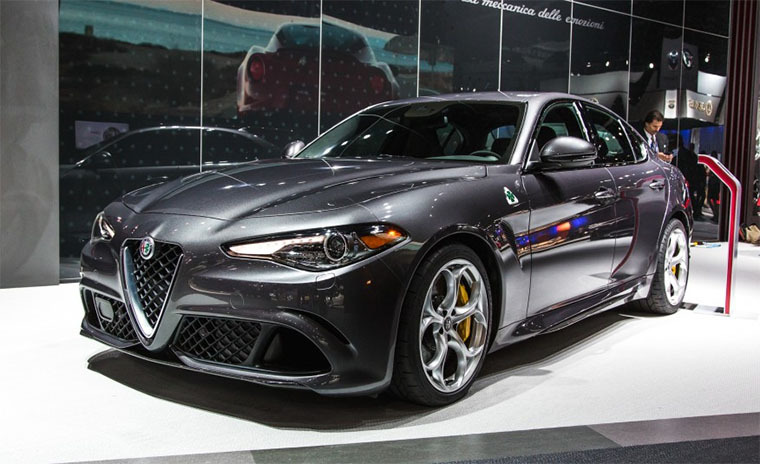 The Stelvio actually shares many chassis and engine parts with the Giulia – along with some of the saloon’s styling. The headlight treatment and front grille are very similar, giving the SUV an imposing look. Under the skin, you’ll be able to pick from two engines at launch – a 2.0-litre turbocharged petrol with 276bhp, or Alfa’s 2.2-litre turbodiesel with 207bhp and a useful 470Nm of torque. Both cars are four-wheel drive, and they get an eight-speed automatic gearbox as standard; a manual isn’t offered, even as an option. Further down the line, Alfa will wheel out a 503bhp flagship version of the car, based on the same Ferrari-derived twin-turbo V6 that we’ve already sampled in the Giulia Quadrifoglio. Inside, it’s very much like sitting in a slightly elevated Giulia; the dashboard layout and design are basically identical. But that’s no bad thing, because this high-quality finish keeps it upmarket. Nothing lasts forever, and while the elegant Aston Martin Vantage seems to have been around for an age, it’s due for replacement this year. It will use the first fruits of the brand’s tie-up with Mercedes, because it will get an AMG-tuned V8, and there will be coupe and roadster models. Our exclusive image shows an evolutionary design, as with other Astons, with cues from models like the Vulcan. Hatchbacks don’t get much hotter than Honda’s all-new Civic Type R. Based on the new Mk10 family car, it sticks with the outgoing model’s 2.0-litre four-cylinder turbo, but ups power by 10bhp to 316bhp. It’s front-wheel drive and comes only with a six-speed manual box, as before. No performance figures have been released, but the new Type R is likely to be slightly faster from 0-62mph than the outgoing car, which took 5.7 seconds. It also retook the front-wheel-drive Nurburgring crown from the VW Golf GTI Clubsport S.
In a bid to make the Type R easier to live with, a Comfort driving mode has also been added on top of Sport and R+ modes. There’s a rev-matching function for the first time, designed to help smooth downshifts and maintain momentum. The cabin has also been overhauled, featuring a new infotainment system, steering wheel and centre console. Flagship limos are usually a showcase for a manufacturer’s cutting-edge technology, and the new Audi A8 is no exception. It’s set to be one of the first cars in the world to feature Level 3 autonomous driving tech. This builds on Audi’s Piloted Driving system, and means that the driver can hand control over to the car in certain situations, chiefly on the motorway. The A8 will also showcase Audi’s new design direction – previewed by the Prologue Concept – featuring wider grille styling and exaggerated proportions. With a new A5 Coupe in dealers, it was only a matter of time before the flagship RS 5 would break cover. Audi has launched the RS model sooner in the A5’s lifecycle to satisfy customer demand for high-performance models, and with its big wheels and meaty bodykit, it looks the part. Under the skin, quattro four-wheel drive is present, but power comes from a twin-turbo V6 TFSI co-developed with Porsche. It delivers as much power as the V8, but more torque. Crossovers are as popular with buyers as hatchbacks these days, so it’s no wonder the high-performance crossover is becoming a regular on the market. Audi is readying a rapid version of its Q2 called the SQ2, and it’s set to get the same suite of subtle styling updates as other S-badged models, from quad exhausts to a satin silver finish for the wing mirrors and C-pillar blades. You can expect quattro four-wheel drive and a 306bhp 2.0 TFSI turbo four-cylinder engine lifted from the S3 hot hatch, too. The 2 Series doesn’t have much in the way of competition, but that isn’t stopping BMW from putting its smallest coupe under the knife. New hexagonal daytime running lights – just visible in our spy shot – represent the biggest update to the front-engined, rear-drive coupe, while the rear light clusters have been given a minor refresh. The engine range is likely to benefit from improved emissions and performance, plus the updates will be added to the 2 Series Convertible and rapid M2 flagship. BMW has broadened the scope of the all-new 5 Series line-up with the latest practical Touring model. The sleek estate goes toe to toe with the Volvo V90 and Mercedes E-Class Estate. The Touring commands a £2,360 premium over the saloon, but the extra cash brings an added dose of practicality. Luggage space increases by 40 litres to 570 litres; that’s 174 litres more than in the Volvo, but 120 litres shy of what’s on offer in the Mercedes. Fold the 40:20:40-split seats and BMW claims a maximum capacity of 1,700 litres. From launch, buyers will have the option of two diesel and two petrol engines. As in the saloon, the entry-level Touring is badged 520d and uses a 187bhp 2.0-litre diesel; a more potent 261bhp 3.0 diesel powers the 530d. The smallest petrol power plant is a 248bhp 2.0-litre turbo also found in the 530i, while a 335bhp 3.0-litre tops the range in the 540i.